So, what’s with the dot? As a business owner, you have sacrificed a great deal of your life working toward ensuring greatness in your business. As our client, your dreams and goals are as important to us as our own. We have experienced the same issues as all business owners through our own journey- and through our experience we have learnt some really valuable, yet hard fought lessons. This has lead us to the conclusion that business is not what you may think it is. Business is just one part of what makes you, you. You are also a husband or wife, a mother or father, a team member… just another human being trying to figure out the meaning of this big thing we’re living called life. So what are your dreams? What is the picture you are trying to paint of your life? Seeing your child off to university? Travelling the world? Retiring early? Your dreams are worth fighting for. For each of these facets you have dreams and expectations. But how many times have the things you had hoped to achieve in your personal and family lives taken the back seat to the things you desire in your business? Successful people in business have the habit of creating defined goals for each of these areas and work toward the completion of all of them, not just those in their professional lives. 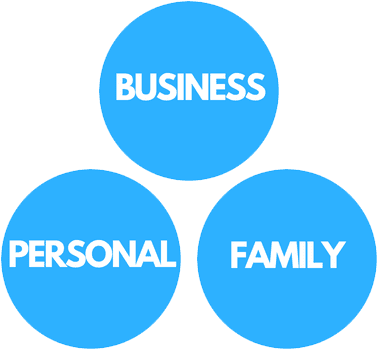 Too often business owners are achieving their business goals, only to discover that their family goals have since suffered. This brings us to “The Dot”. What is the dot? Well, it’s your business. It’s your family. Your goals. Your business. Your LIFE. That little dot at the end of our name represents your personal, family and business goals all coming together to work in synergy to create your perfectly balanced world. So, how do we come into this equation? We’re glad you asked, at PTP we are fighting for your dreams just as hard as you are. Using our unique 3 circle strategy, we work with you to identify goals in every facet of your life, and give you the tools and the roadmap to achieve them. Our team of talented accountants complete your compliance work quickly and simply so you can get on with your life. And for your peace of mind, our Wealth Management team is on hand to invest your earnings, grow and protect your wealth, and most importantly, your future. PTP is immensely proud of our beginnings in the accountancy world. We are so excited about our personal growth into an advisory firm that can provide service and advice that covers every aspect of not only business, but of life. We are positive we have the skills, knowledge and determination to bring all the aspects of your life together into one perfect, symmetrical “dot”.